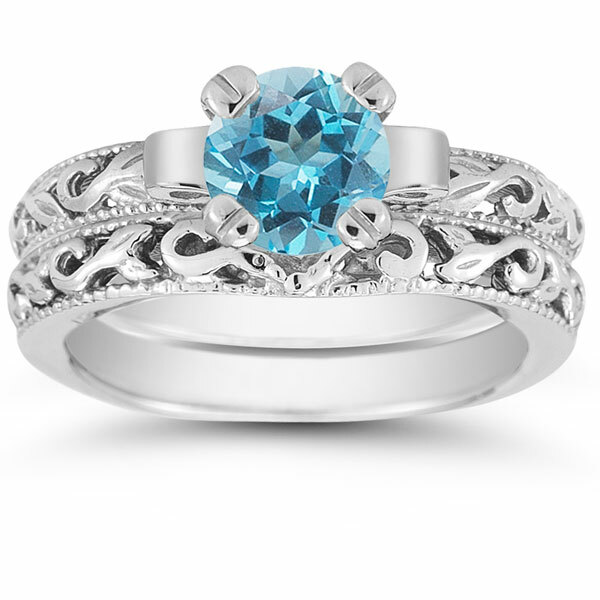 The brilliance of blue topaz gives this bridal ring set its beautiful look. 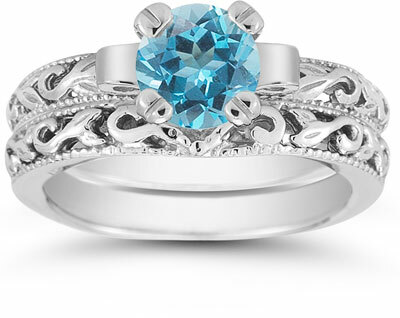 A single blue topaz gemstone offers a gorgeous shimmer and lovely azure coloring for this unique wedding ring set. The two bands offer their own beauty. Cast in luminous sterling silver, the bands bring an art deco style with paisley-like swirls and milgrain edging. These important design elements are perfectly crafted to provide style and substance to this blue topaz bridal ring set. We guarantee our Blue Topaz 1 Carat Art Deco Bridal Set in Sterling Silver to be high quality, authentic jewelry, as described above.